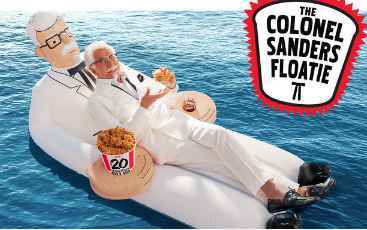 KBC brings you the KFC Colonel Sanders Floatie Giveaway where they will be giving away Colonel Sanders Floatie to 750 lucky winners. Total ARV of all prizes: $60,000. How To Enter The KFC Giveaway At Kfcfloatie.com? Visit this link: kfcfloatie.com. to go to the giveaway page. When To Enter: The KFC Colonel Sanders Floatie Giveaway begins at 12:01 a.m. Pacific Time (“PT”) on 5-22-18and 11:59 a.m. PT on 6-22-18. Sponsor: KFC Corporation, 1900 Colonel Sanders Lane, Louisville, KY 40204. Sweepstakes Prize: The Grand Prize Winner will receive the following (the “Grand Prize”):750 Winners: Colonel Sanders Floatie ARV: $80 each.Total ARV of all prizes: $60,000.